To make sense of the world we rely on many different kinds of information. A benefit of combining information across different senses is that we can determine what is out there more accurately than by using any single sense. The same is true for different kinds of information within a single sense. Within vision there are several ways to perceive depth. In a normal film, depth is apparent from perspective, for example in an image of a long corridor. This kind of depth can be seen even with one eye shut. In a 3D film, and in real life, there is also binocular depth information given by differences between the two eyes." The researchers at University College London and Birkbeck, University of London tested how adults and children deal with perspective and binocular depth data. They found that it's not until a children are about to hit puberty - around twelve years old - that they actually gain the ability to combine these pieces of information together. 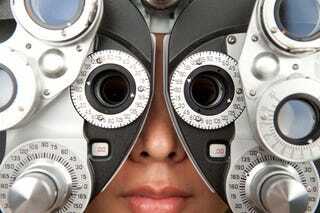 As their tests showed, adults will be fundamentally better at certain visual tasks than children. For instance, when the test subjects were given 3D glasses and asked to judge which of two slanted surfaces was "flatter", adults consistently did better because the test relied on judging both perspective and binocular depth. A single, unified estimate was superior to the individual data the children were getting from their separate visual senses. But that doesn't mean adults are always better equipped to judge a visual test. The researchers presented their subjects with specially designed 3D discs. These discs presented contradictory perspective and binocular depth information, which meant adults had a very difficult time combining the information to judge whether one disc had the same slant as another. Children that lacked this sensory fusion were easily able to distinguish which discs had the greater slants. Babies have to learn how different senses relate to each other and to the outside world. While children are still developing, the brain must determine the relationships between different kinds of sensory information to know which kinds go together and how. It may be adaptive for children not to integrate information while they are still learning such relationships - those between vision and sound, or between perspective and binocular visual cues."